Cashew nuts are actually seeds that stick to the bottom of the cashew apple which grows on cashew trees. Cashew trees are native to the coastal areas of northeastern Brazil. 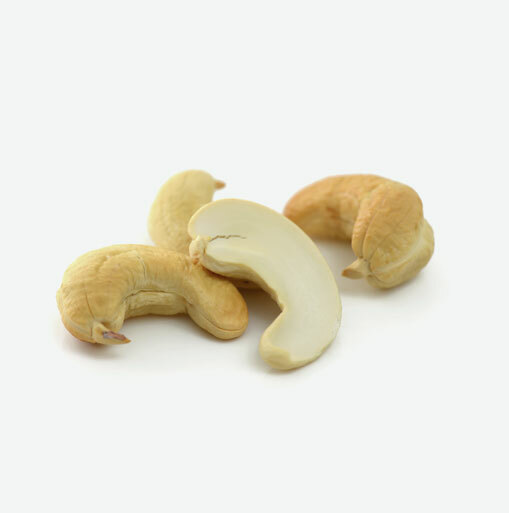 The seed we know as the kidney-shaped cashew “nut” is firm with a slightly spongy texture and has a delicate flavour. Cashews are not usually sold in their shells because the shells contain a caustic resin known as cashew balm which must be carefully removed before cashew nuts can be eaten. This resin is actually used in industry to make varnishes and insecticides. Cashews belong to the same family as the mango and pistachio nut. Cashews have a lower fat content than most other nuts. They contain oleic acid which is the same heart-healthy monounsaturated fat found in olive oil. Research studies show that oleic acid promotes good cardiovascular health, even in individuals with diabetes. Studies of diabetic patients show that monounsaturated fat, when added to a low-fat diet, can help to reduce high triglyceride levels. Triglycerides are a form in which fats are carried in the blood, and high triglyceride levels are associated with an increased risk for heart disease. Make sure that you include some monounsaturated fats in your diet by enjoying cashews. Cashews are generally available in prepackaged containers as well as bulk bins. Just as with any other food that you may purchase in the bulk section, make sure that the bins containing the cashews are covered and that the store has a good product turnover so as to ensure its maximal freshness. Whether purchasing cashews in bulk or in a packaged container, make sure that there is no evidence of moisture or insect damage and that they are not shriveled. If it is possible to smell the cashews, do so in order to ensure that they are not rancid. Since cashews have a high content of oleic acid, cashews are more stable than most other nuts but should still be stored in a tightly sealed container in the refrigerator, where they will keep for about two months or in the freezer, where they will keep for about 4 months. Try mixing cashews with other nuts and dried fruits to make a healthy snack. Just before taking sautéed veggies off of the stove, add some cashews to increase their nutritional benefits and taste. Sauté cashews with shrimp, basil and green beans for a delightful Thai inspired dish. Cashews with a little bit of maple syrup make a great topping for hot cereals such as oatmeal or cream of wheat. If you would like to roast cashews at home, you can do so gently by placing the cashews on a cookie sheet and roast them at about 160 to 170F in the oven for about 15 to 20 minutes. This low roasting method helps to preserve the healthy oils in the nuts.